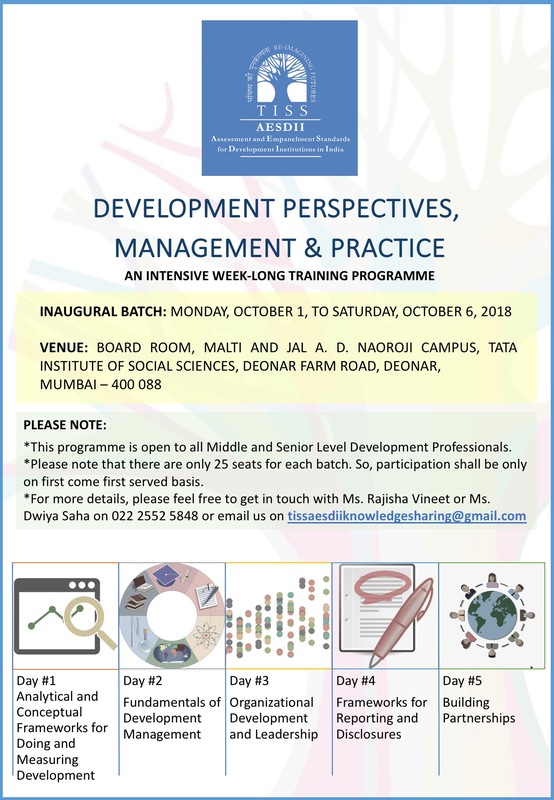 We are happy to announce that applications are now open for the inaugural batch of “TISS AESDII “Development Perspectives, Management and Practice” (DPMP), a 5-day intensive training programme at Tata Institute Of Social Sciences. This workshop is designed to provide a comprehensive knowledge armour for middle and senior level development actors, through a multi-disciplinary approach and encourages participants’ active involvement and experience sharing. The TISS AESDII DPMP intends to be a knowledge creation and dissemination forum for providing perspectives, skills, theory and practice towards a joint effort to deliberate and act toward ‘people centred sustainable development’ policies. The programme is designed using a collaborative and convergence approach whereby for the first time, various Departments and Faculties within TISS as well as across TISS campuses, as well external academic collaborators, will come together to deliver cutting edge insights and skills, through a blend of theory and praxis, lectures and workshops, required for any development sector professional. Last Date to make the payments – 25th September, 2018. Participants are requested to note that the above amount includes Breakfast, Lunch and three rounds of Tea/Coffee every day, Reference Materials, Institute Charges @ 10% and GST @ 18%.